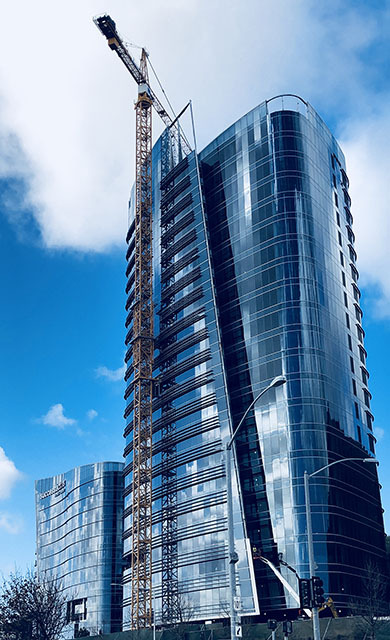 Genesis Towers — PARADIGM Structural Engineers, Inc. The new building ownership requested that PARADIGM replace the original Structural Engineer of Record (SEOR) on the South tower. Additionally, PARADIGM was asked to become the SEOR for the design of the North tower. The effort associated with the south tower was converting the existing building to the first mid-rise lab building in South San Francisco. The effort with the North Tower was more substantial as in addition to converting the building from an office building to the second mid-rise lab building, PARADIGM also evaluated and modified the existing steel framing which was yet to be erected. The modifications were both for the lab modifications as well as some LFRS strengthening to meet the latest seismic design requirements. As part of the development, PARADIGM was selected as the SEOR for the 7-story parking garage extension which consists of a 642,000 sq. ft. 2038 stall parking structure. Part of our effort was to rehabilitate those elements placed during the original design and construction so as to meet the requirements of the most recent code.